This version also contains other usability enhancements and bug fixes. Please Note : To take advantage of the new features that are being introduced, please ensure that all the APs in your network are updated and running the latest firmware version (2.2.0.0.27). Please login to http://cloud.xclaimwireless.com with your existing CloudManager account to take advantage of new features. We recommend reloading the page using "Control+Shift+R"(windows) or "Cmd+Shift+R"(osx) to ensure that the browser reloads all the elements of the page and ignores its local cache. Also, to help you understand Single-Hop mesh concepts and configuration , we have attached a document with all the required information. Hello, as I understood, there is no support of mesh for Xi-2 right now? Do you plan add this feature to that one or not? We do not see the support of mesh in Xi-1/Xi-2 in our product roadmap. So you are lying in your product sheet or how can you explain that? Apologies for the confusion caused. 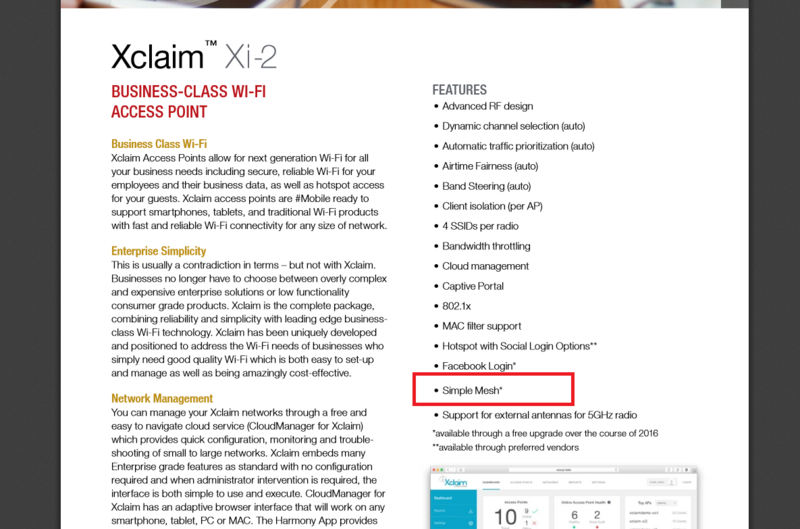 There is a mistake in the product datasheet that is indicating support for simple mesh for the Xi-2. We will get this corrected immediately. Although we do not have mesh support planned for the Xi-2 APs, we will take this as a feature request and plan if this can be incorporated in any future releases. I believe that this is not a mistake, because info about simple mesh is on product list for Xi-2 for "ages" - since maybe 2015!!! I think that you only change your feature policy and want people to buy rather Xi-3 and higher. Please, give me a solution "how can I mesh two (and more) Xi-2 where only one can have ethernet uplink...."
or at least how can I complain about your policy and return your HW which does not met requirements you declared it would have! do you have any answer or solution for (I believe not only) me and those who believed that you will release that feature for Xi-2 ? I check some more "internal" details and there is no HW reason not tu release it so... where is the problem? We have taken this as a feature request and we will analyze and see if this can be implemented in the next Cloudmanager/AP updates. I agree, the Xi-2 and Xi-3 are almost the same (i think they are technical the same) and that only the firmware/software is different. I also would like to see that the XI-2 have the mesh function. The next feature requestion would be a mesh option within the web-interface. We don't (not yet) use the cloudmanager. I just want to make a VPN to a customer and adjust the settings via the web-interface. so will there be a mesh option with-in the web-interface? We are no longer releasing updates for web interface since we encourage our customers to manage APs via CloudManager. We highly recommend you switch to CloudManager which has far more superior features that are not available when managing the APs via the local mode. Apologies for the delay. We will check and let you know shortly. Hey @shriramrs I'm still not able to access the MSP account, could you please help me? We sincerely apologize for the lack of communication. We can understand your frustration. We will come up with the roadmap and list upcoming features ASAP. Please let us know If you would like to have a call with us?